With Derek Jeter’s pre-Valentine’s Day bombshell, that he will not be returning to Major League Baseball after 2014, please permit me (Evander) to reflect a few moments on aspects of his remarkable career. 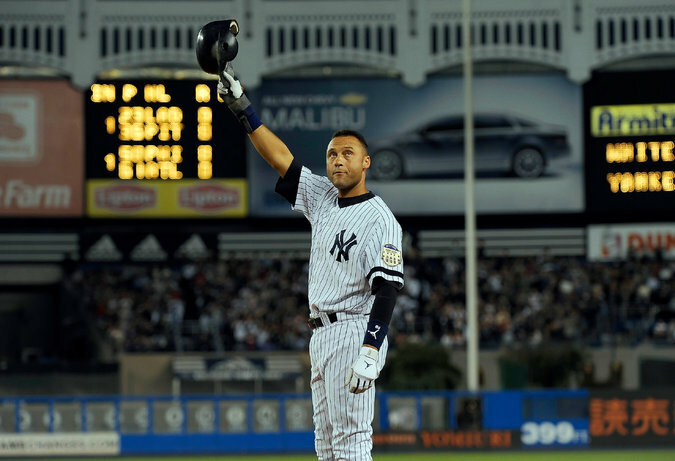 I have come to realize that Jeter probably has been seen by more stadium-packing fans than any ballplayer in history. This is a result of his skill and Modernity-lean, rock-star (Elvis, Dylan) magnetism; that he plays for the New York Yankees and has been in hyper-intense postseason competition all but two of his years, and except for one has participated in extensive interleague play; that his long career coincided with and helped jet-fuel a rejuvenation of fan interest in the sport. It is astonishing that Jeter has never collected a Most Valuable Player Award, as he has been “The Franchise” of the most-successful franchise in North American sports history. Jeter was drafted sixth overall in 1992, during a tumultuous period for the then-perennially slumping and underachieving Yankees, a time when principal owner George M. Steinbrenner was under suspension for unsavory attempts to undermine the life and career of Dave Winfield. The first baseball game attended by Right off the Bat coauthor Martin, Fan Appreciation Day 1996, was a showcase of all Jeter would be. He was in the middle of every rally, every important play. This was Jeter’s first full season. At the time, the Yankees were largely (though not exclusively) composed of successful oldsters like Tim Raines. Raines never believed Jeter could be a leadoff hitter, that he struck out too often—and Jeter has struck out way more than one expects of a batter at or near the top of a lineup. Aside from Tony Oliva (whom I always believed to be a Hall of Famer), Jeter might have the greatest inside-out swing ever. Oliva was a left-handed hitter, Jeter right-handed. This swing, from either side, permits the batter the longest look at a pitch hurtling toward the catcher. Both players could hit balls well outside the strike zone. Along with many aspects of Jeter’s personality and game, this swing cannot be taught. More than any glam-rocker or tattoo-inflated postmodern-type athlete, Derek Jeter’s career and exit may more closely parallel Sachin Tendulkar’s. Jeter, perhaps unconsciously, has modeled his farewell on another icon—(again, in Hemingway’s words) the great DiMaggio. Whether Derek Jeter can ever play again, really play, on his 2012-surgically repaired ankle, remains to be seen. It’s just a little difficult to bet against him. This entry was posted in Baseball, Cricket, Right Off the Bat Book, Yankees and tagged Dave Winfield, Derek Jeter, George Steinbrenner, Joe DiMaggio, Literature, Most Valuable Player Award, National Baseball Hall of Fame, New York Yankees, Sachin Tendulkar, Tim Raines, Tony Oliva. Bookmark the permalink.